We should agree that every Christian should be concerned with reaching out to the world with the Good News of Jesus Christ. Indeed, throughout our recent studies in Acts we’ve seen that the early church placed a greater emphasis on outreach and evangelism. 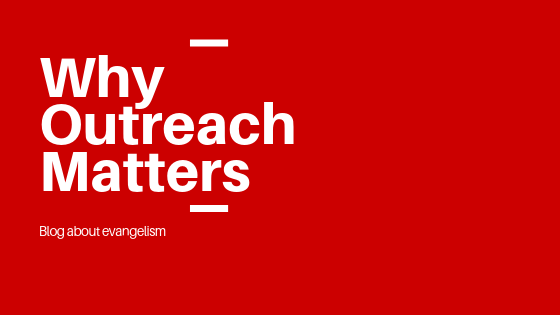 Evangelism is the message of the gospel – we don’t go “evangelising”. We go on “outreach”, and the accompanying message is the “evangel”, the good news message – the gospel. It is our hope that we “outreach” to people to draw them into a place where we can evangelize (give them a good news message) them. For example, in the past, our family fun days have focussed on providing families with opportunities to have fun so that we can invite their parents to come to our church where we will take the opportunity to share the Good News with them. Likewise, the upcoming Andy Kind event is an “outreach” so that we can “evanglise“. This is one of the primary functions of the church .